In 2010 I went on a solo business trip to London. It was my first time in the city, so I decided to tack on a few extra days to the trip to explore. I didn’t really make any plans, so that exploration simply involved going to a landmark I knew existed and then wandering around until I found something else interesting. What that meant was I saw the Queen’s Castle, Big Ben, Shakespeare’s Globe, and a lot of pubs. After trying (and honestly not being very impressed by) all the staple beers on tap, I eventually switched to ciders (which are phenomenal in England BTW), and worked my way through those. One of my last nights in town, I stopped into a pub called Bag of Nails (another fave part of drinking in England were the pub names) for a pint, and found Crabbie’s. When I ordered it, I have to honestly say I had no idea what it was. All I knew was there was a beer menu on the wall, it had the word Crabbie’s on it, and I needed it. Like the pub I was in, it was a selection made entirely based off of its name. But, it was a solid one. In England, Crabbie’s is served in a large glass filled with ice, just like you’re drinking a soda. The alcoholic ginger beer was the first alcoholic soda I had ever had (if you don’t count all the rum and Cokes I drank in college), and I was instantly hooked. I probably had three or four of them while I was at the pub that night, and then when I came across a shop selling bottles the next day on my way to the airport, I bought as many as I could fit in my suitcase to bring home. Alcoholic soda wasn’t a trend in the US yet (heck a craft beer was even hard to come by in my hometown), and this stuff was magical. In fact, Crabbie’s has been making this stuff long before the whole alcoholic soda trend took off – the company dates back to 1801. Crabbie’s started distributing in the United States in 2012, but I didn’t come across my first bottle until late last year. 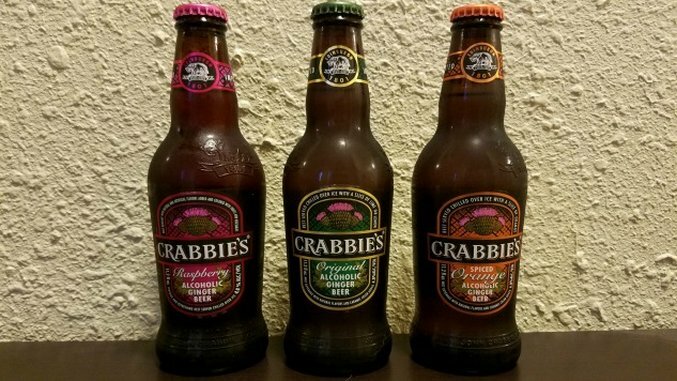 After reviewing a few other alcoholic sodas, the folks at Crabbie’s offered to send me a few bottles (they have flavors now!) to try out, and so I took them up on the offer — could it really be as good as I remember it? The short answer: OMG yes. One thing that’s distinctive about American takes on alcoholic ginger beer is that on some level they all taste artificial. Sure, you get that ginger flavor and smell, but taste wise there’s always something missing. Crabbie’s ships its ginger from the Far East, and then steeps it for at least six weeks, following a “secret recipe” for awesomeness. The result is something that actually tastes like ginger. It’s not too sweet, not too spicy, it’s ….just right. While it’s not something that I think I would necessarily drink a ton of in a sitting, one of these definitely hits the spot, and at 4.8% isn’t going to ruin your evening. In addition to the original (what I had in England), the company also sent over a Spiced Orange and a Raspberry version. Those were… not as delightful. What I really enjoy about the original Crabbie’s is its fresh, natural flavor. When you start adding fruit into the mix, things start to go downhill. The Raspberry has a tart, almost sour-beer character to it. I went back and forth with this one on whether I liked it, or hated it. The nose is of fresh raspberries, and honestly, it kind of tastes like someone just threw fresh raspberries into the regular ginger beer. After finishing the bottle of ruby-colored soda, it’s not something I’m going to actively pursue drinking again, but I think there’s certainly a place for it. I kind of wish I’d tried out mixing it with some liquor; I think that would be this one’s time to shine. The Spiced Orange had a more traditional color, but a considerably less traditional taste. I had expected the drink to taste more like an orange soda, but what I got was more on-par with a spiced cider. It’s bitter, which takes away from the refreshing feeling you get from other other two varieties. Of the three, this one was by far my least favorite. For me, I think the original Crabbie’s is still the clear victor. Emily is Paste’s Assistant Drink Editor and wishes she was drinking a Crabbie’s at Bag of Nails right now. You can see what she is doing on Twitter @emily.